In presence of a significant magnesium concentration, collect Ca2s as well as Ca2p region. In presence of magnesium, check for Ca2s to prevent misinterpreting Mg KLL as Ca2p. There is only a small range of Ca 2p chemical shifts (<1eV) for typical compounds. Limited use in determining chemistry. 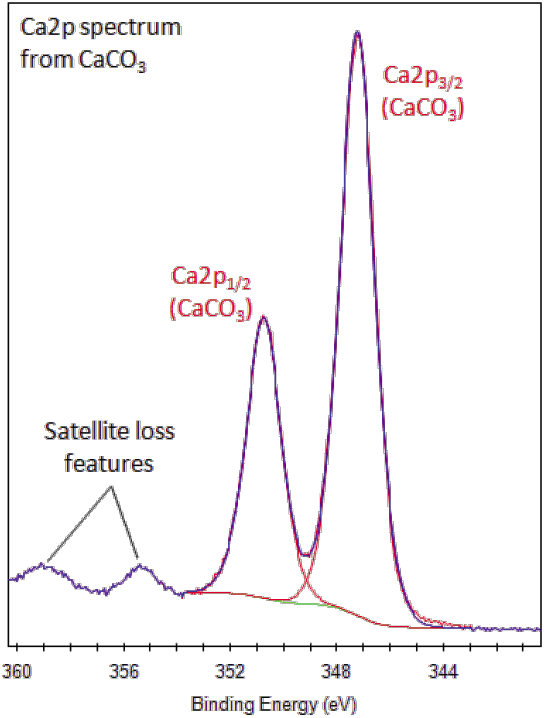 Ca2p peak has clearly spaced spin-orbit components (Δcarbonate=3.5eV). Satellite loss features are sometimes observed in the Ca2p region. Reasonably strong satellites are observed for CaCO3, for example, but only weak satellites for tribasic calcium phosphate. Since calcium is a highly reactive metal, it is always present as a compound. CaCO3 may degrade under prolonged X-ray exposure, giving CaO+CO2. Calcium compounds such as calcium oxide or hydroxide may have reacted with atmospheric CO2, forming carbonates. 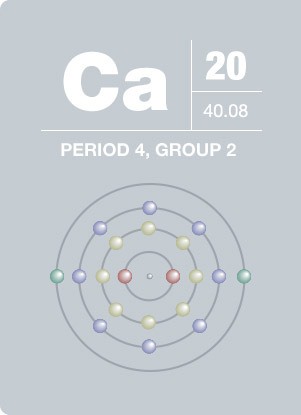 H. Davy first isolated calcium in 1808. It is the fifth most abundant element in the earth’s crust and is an important component for living organisms on the cellular level, as well as for the formation bones and teeth in higher organisms. Besides being an essential element for living things, calcium is used as a reducing agent in the extraction of thorium, zirconium and uranium, and is an alloying agent in the production of aluminum alloys. Chemical refinery processes commonly use quicklime (CaO), which is also an important component in cement. Water dissolving calcium compounds in the earth, such as limestone, form caves – including stalactites and stalagmites – and are the major cause of hard water.